Musician. Band leader. Soldier. Missing in action. In 1942, at the age of 38 Glenn Miller was too old to be drafted. Wanting to support the war effort, he applied to the Navy but was rejected. He finally found acceptance with the Army who then transferred him to the Army Air Forces. As a Captain, Miller served as assistant special services officer for the Army Air Forces Southeast Training Center where his role was to support morale of the troops and civilian workers. Playing trombone with the Rhythmaires, Miller appeared in service halls and recreation clubs in Maxwell, Alabama. He then formed a military marching band and wrote multiple successful songs that were aired on the radio. By the time he was granted permission to take his fifty piece orchestra to England, Miller had been promoted to Major. On December 15, 1944 Miller boarded a small military plane and set out over the English Channel for the newly liberated France where he would entertain the Allied troops. He was never seen again. Over the years, theories abounded as to what happened. Conspiracy theories surfaced: Miller never got on the plane and was assassinated during a secret mission; the trip was unauthorized and the plane went down in the fog, the plane was destroyed by friendly fire; his death of a heart attack at a bordello was covered up. 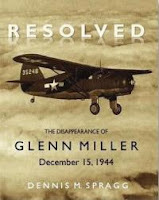 According to Dennis Spragg, a senior consultant to the Glenn Miller Archive at the University of Colorado Boulder and author of “Resolved: The Disappearance of Glenn Miller,” the small plane probably crashed in the English Channel within seconds of take off after fuel intakes froze. The steel-framed, wood and fabric plane all but disintegrated, sending its heavy Pratt-Whitney engine plunging to the bottom. Spragg is confident about the veracity of his theory. He spent more than four years and made dozens of trips to Washington, D.C., London and U.S. Air Force archives. According to Sprague documents from the investigation were boxed up after the war, sent to the United States and locked away. At the time of his death, Miller left behind his wife and two children.